A prequel that remembers to add heart to the comedy and action in a way that pays homage to the source material. A lone warrior from a distant planet suffering from amnesia and left mute from battle befriends a young woman dealing with the loss of a parent. When enemies of the warrior find out where he has fled to, they agree to cooperate with a covert military organization on the new planet they have landed on with the goal of using the primitive technology of the inhabitants to pinpoint the warrior’s exact location. The warrior forms a bond with his human companion as they find strength in each other to overcome the obstacles in their lives that they may not be able to face alone. B-127 aka Bumblebee is an Autobot scout from the planet Cybertron who was sent to Earth by his leader to set up a base of operations for their faction regroup and plan their next move. Charlie Watson is a teenager traumatized by the death of her father and resentful of her mother and little brother for moving on, who finds B-127 and names him Bumblebee after aiding him in his repairs. Jack Burns is a soldier for the military organization Sector 7 who wants to find B-127 after being scarred during an altercation between B-127 and Blitzwing on their arrival to Earth. Shatter and Dropkick are Decepticon soldiers tracking B-127 with the goal of extracting information on the whereabouts of his leader Optimus Prime to kill him. 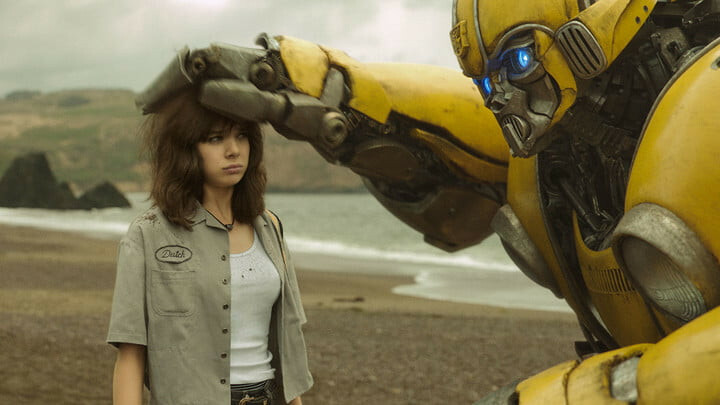 Bumblebee is a touching sci-fi movie due to the fact that it is also a coming of age tale that remembers to have heart as it dazzles the viewer with amazing visual and special effects that makes transforming alien life forms feel real. This prequel in the Transformers franchise is able to find the right balance of drama, comedy and action as it performs a retcon (retroactive continuity) on the lore established by the previous films to streamline its present story. It is obvious that the cast of this film are proud of the performances they put in from Angela Bassett & Justin Theroux providing the voices of two of the Decepticon invaders to Hailee Steinfeld & John Cena as the humans with opposing opinions on a certain Autobot visitor from Cybertron. The way Travis Knight directs this motion picture shows that what he did with Kubo and the Two Strings was no fluke and I look forward to his third directorial effort. I remember when I fancied myself an up and coming screen writer (still yet to be discovered) that I had the idea to write a live action sequel to the Dungeons & Dragons 80s cartoon using the structure of The Land Before Time and I get the feeling Christina Hodson decided to do the same thing with this script but used the structure of The Iron Giant which works okay for this story. The music by Dario Marianelli works for this retro interpretation and brings to mind both the work of Vince Dicola in the original Transformers animated movie and the work of Steve Jablonsky in all of the Michael Bay helmed Transformers films. It was awesome seeing some of the Generation 1 Transformers looking like they did on the small screen but in silver screen glory like Soundwave, Ravage, Shockwave, Wheeljack, Brawn & Cliffjumper among others. If you enjoyed films such as E. T. the Extra-Terrestrial, G. I. Joe, Diving In, Batteries Not Included, Herbie The Love Bug, Lilo & Stitch, Spaced Invaders, Explorers or Flight of the Navigator then I think you can have a good time with this theatrical release. I enjoyed it and I know it wasn’t just my nostalgia taking hold of me because I plan on seeing it again. I rate this film a rating of 4 out of 5.